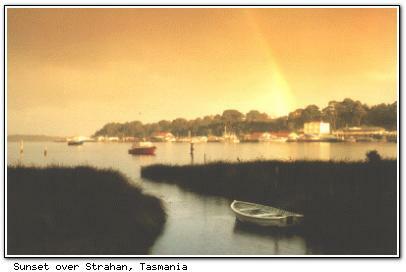 Strahan (pop ~550) is the only safe anchorage on Tasmania's west coast. 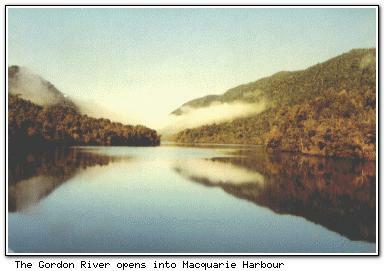 It is located on magnificent Macquarie Harbour, which is one of the largest harbours in the southern hemisphere. Strahan's history is a showcase of Tasmania's. The penal settlement at Sarah Island was the most brutal in the state, where unruly convicts from Port Arthur were transported. Strahan was the major port during the west coast's boom mining days late last century, and the port was also used for the export of Huon pine timber from the surrounding bush. These days, the harbour is an anchorage for crayfish, abalone and shark fishing fleets. The area also serves as a gateway to exploring the Gordon-Franklin Wild Rivers National Park. Cruises down the Gordon River depart daily, and include a journey across Macquarie Harbour to Hells Gates, where the waters of the harbour and Indian Ocean literally collide to form a treacherous passage of water. Ocean Beach, with large sand dunes and huge surf visible from the harbour cruise, is 6 km from the town and is Tasmania's longest beach. Those preferring a faster ride can try jetboating on the nearby King River. Many other tours depart from Strahan, including to the Henty sand dunes, 4WD, forestry and fishing tours, and scenic seaplane flights over the south-west wilderness. In Strahan itself is a gemstone museum and Huon pine sawmill. It is possible to learn more about Huon pine at the Teepookana Forest Reserve. Befitting a great tourist town, Strahan has numerous fine accommodations, including two 4½-star, three 4-star and six 3½-star facilities (RACT rated) plus a youth hostel.